Three more sisters traveled from Leavenworth in 1875 to Virginia City to open St. Mary’s Hospital. One of them, Sister Irene McGrath, was a young novice barely eighteen. By 1879, the mining camp had dwindled and patients were few. The sisters were never meant to be ornamental, and so they moved on. Butte, with its filthy streets, foul air, and teeming underbelly desperately needed a hospital. Veteran Sister Mary Xavier McLaughlin stood at mine entrances begging funds. Six months and eight thousand dollars later, sisters built St. James Hospital in 1881. Their negotiated arrangements with the mining companies to provide employee healthcare came long before the concept of Health Maintenance Organizations (HMOs). When Sister Mary Xavier died suddenly in 1884, the miners’ reverence for the nuns became obvious. They sat up all night with the remains of “Sister Beggar,” underscoring her spiritual and temporal impact. Next, at the urging of Marcus Daly, the sisters opened St. Ann’s Hospital in Anaconda in 1889. In another arrangement with the sisters, Daly’s Anaconda Copper Mining Company required a small monthly subscription to the hospital fund from each employee, which allowed several additions to the building over the next decade. In 1906, when Montana law required pharmacists to pass state board examinations, Sister Mary Gertrude Barrett of Butte’s St. James Hospital became the first woman to pass this exam and become a registered pharmacist. Billings was the sisters’ final Montana frontier. St. Vincent’s Hospital accepted its first patients in 1898. In 1916, when infantile paralysis afflicted at least 125 children in Billings, Mother Irene McGrath—the former novice at Virginia City—established the state’s first children’s ward. 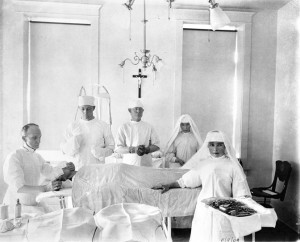 The sisters’ dedication to care for the sick extended to nurses’ training. The first class at St. James School of Nursing in Butte graduated in 1909. St. John’s in Helena and St. Vincent’s in Billings also established training schools. When nurses’ training later shifted from hospitals to academic institutions, these hospitals collaborated in a pre-clinical training program at Carroll College in Helena. The course prepared students for hospital training from 1943 to 1970. By 1967, more than a thousand nurses had graduated from St. James, and 60 percent of all the nurses in southwestern Montana had trained there. The modern Sisters of Charity of Leavenworth Health System (SCLHS) incorporated in 1972; today it includes eleven hospitals and four clinics for the poor and underserved in Colorado, California, Kansas, and Montana. In Montana, the SCLHS now includes St. James in Butte, St. Vincent’s in Billings, and Holy Rosary Healthcare in Miles City, purchased from the Presentation Sisters in 1997. As Montana evolved from a remote wilderness, medical services also evolved. The Montana Deaconess Hospital in Great Falls is equally important to the socio-religious and medical history of Montana. Augusta Ariss, a deaconess and an 1897 graduate of the Chicago Training School, came to the fledgling Great Falls hospital as its first superintendent in 1902. She stayed for thirty-three years. In 1913, Ariss helped establish the State Board of Nursing; under her influence, nurses, not doctors, administered the board. Under Ariss’s leadership, the Deaconess Hospital in Great Falls ushered in a national trend to professionalize nurses training programs. Deaconess hospitals opened in Butte, Sidney, Havre, and Billings; Deaconess teaching hospitals located in Glasgow and Bozeman. 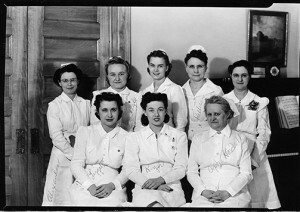 The Great Falls facility served as the mother institution in Montana, supplying graduates to staff the state’s other Deaconess institutions. In 1937, Great Falls Deaconess Hospital nursing school affiliated with Montana State College at Bozeman, fulfilling Augusta Ariss’s longtime goal. Eventually, the Great Falls Deaconess Hospital evolved into the not-for-profit Benefis Health System of today. Religious organizations also played a role in developing Montana’s earliest social services. To learn more, read Early Social Service Was Women’s Work. Sister Providencia Tolan, a nun teaching in Great Falls, also endeavored to improve her community. Learn more by reading Sister Providencia, Advocate for Landless Indians. Did you know? The Holy Rosary Hospital in Miles City is a national register landmark. Learn more by visiting the places page! Baumler, Ellen. “Methodist Deaconesses.” Blog, Montana Moments, March 4, 2013. —, and Sister Dolores Brinkel. “What Can a Woman Do? : The Sisters of Charity and Their Pioneer Missions.” Montana Woman 216 (November 2012): 83-85. Sisters of Charity of Leavenworth. Montana Historical Society Vertical File, Montana Historical Society Research Center, Helena. Stephens, Myka Kennedy. “Called to Serve: A Brief History of the Methodist Deaconess Movement.” The Flyer Online 42 (June 2011).